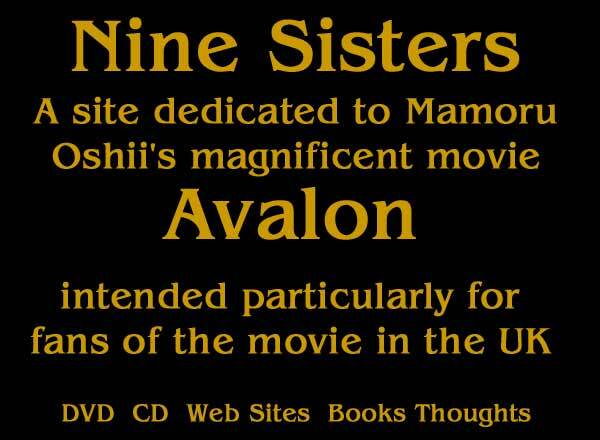 Welcome to Nine Sisters - a site dedicated to Mamoru Oshii's magnificent movie Avalon intended particularly for fans of the movie in the UK. To navigate around the site click in the image map above. To get back to this page click on the section of the site you're in to go back up the page tree. Follow this link for a plain text version of the same information. In some cases there's slightly more information on the textual pages, so take a look at those too even if you can see the images. Thanks to Ashley Hibbert for providing this link to his analysis and comparison of The Matrix and Avalon. It's on a blog page, so go add your comments! Ruh, Brian: Stray Dog of Anime: The Films of Mamoru Oshii. (Palgrave Macmillan Div. of St Martin's Press, New York and Houndmills,;Basingstoke, Hampshire, England; 2004). pp. 165-184 (Ch. 8). "Brian Ruh is (2004) a Ph. D. student in the Department of Communications and Culture, indiana University, USA. He is webmaster of AnimeResearch dot com, a website dedicated to the analysis of Japanese popular culture." (from the back cover notes of the book) Mr. Ruh holds the film in high regard. 14-Mar-2006: Added an analysis of the Arthurian aspects of the movie to the Thoughts page by Andrew King. Thanks to Andrew and everyone else who's contributed over the past months and years. If you're thinking of sending something in (and please do!) let me know if you give permission to add the item to the web site - I'll only put things on once I have an explicit permission to publish. 26-Jan-2006: I'm a bit late posting this, but in my defence life has been a little frantic of late. Rest assured, it's a temporary situation and I'll continue to update the site with any news that comes in. The BBC recently showed a series called Jonathan Ross' Asian Invasion looking at the impact and developement of Asian cinema. The first episode includes an interview with Mamoru Oshii. Most of it dwells on GITS or GITS2: Innocence, but one Avalon question is posed - that of the dog's disappearence. Oshii says that he inserts himself in his films as the dog so that he can look around the environment he has created. In the case of Ash the dog became unneccessary, and probably never existed outside of Ash's perceptions. Ross describes the transition into Class Real as reaching reality, though most opinion on the Thoughts page - mine included - is that Class Real is simply a better level of simulation; something clearly (to me) proved by the effect when Murphy is shot rather than dieing in front of Ash. In any case, this does back up the theories that say that the whole movie is shot from Ash's POV, from the static clouds and people in the tram to the dogs that are mobile and the lush colours in the food. As a total aside, I've recently been reading Masamune Shirow's sequel to GITS, and if you think Oshii does oblique, Shirow takes it further! 22 Apr 2005: Added an item to the Thoughts page from Vadim Solomonik. There appears to be a pirate single disc DVD around also claiming to be a Memorial Edition. More details when I get to check it over. Here's a quick reminder of the position around the Memorial Edition(s). The authentic one is a two disc set complete with two books. One book is part of the packaging, the other is inside one of the Amaray cases. This is long out of print but a few places still have stock. It's not cheap though... expect to pay around US$100 or more. There is a four disc set which I'm still unsure about because it has material I've not seen anywhere else (eg new navigation on Gate To Avalon to 'hidden' features). Lastly there's the single disk. I haven't seen the single disk yet, but in discussion with someone who bought it it seems fairly clear it is a pirate due to poor production standards. 02 Oct 2004: I've found a few more sites that confirm a two disc release (so maybe I'm going to be proved wrong about the content of the release. That said, I still can't find any more about what is going to be on the disc. More info welcomed! 02 Oct 2004: dvdtimes.co.uk reports that the UK release will be a two disc set, but doesn't have any more information on extras beyond what's noted below. The catalogue number is BLD24 for DVD (and BL24 for VHS). 29 Sep 2004: play.com has a bit more about the R2 UK Avalon DVD now, but it's not particularly good news. Polish language with English subtitles (ie not the R1 English dub of the US disc). There's a faint chance of these being new English subtitles, but I have my doubts judging by the rest of this information. No mention of sound formats, so don't expect the Polish DTS soundtrack. The extras are spartan too - Making Of and Avalon SFX with no mention of whether they've been subtitled in English. Compared with some of the other Canal+ group releases (BlueLight, the UK distributor, is part of the group and I think Cineart are too) this is very much a poor cousin (compare the French releases for instance). Release date is 18 Oct and running time is 102 minutes (ie no cuts, which is expected after it got a 12 certificate from the BBFC for cinema exhibition). I have the disc on pre-order and will update the DVD page once I've got the disc. At the moment the best disc remains the Korean one, providing you have a multi-region DVD player. The US R1 disc also merits a mention for its English dub and additional dialogue. 27 Sep 2004: IMPORTANT... Please note that the Bluelight site below (see entry on Sep 6) is seriously out of date. When it talks about a first UK showing it's referring to a couple of years ago! Although Avalon tends to show periodically in film festivals and the like there's not much chance of seeing it in a cinema now... but it's not long until the UK DVD edition comes out. I have it on pre-order so I'll update the DVD page as soon as I get my hands on the disc. 14 Sep 2004: At long long last a UK DVD release of Avalon is coming. It is currently listed on play.com with no information about extras and listed as Polish language, English subtitles. The release is mid-October - extra information welcomed! 6 Sep 2004: Two more Avalon sites to visit. The first, http://www.avalonthemovie.com/, is Bluelight's site for the UK first showing of Avalon a couple of years ago. The second which I thought I'd already mentioned here in past news is Cineart's which was launched to co-incide with the DVD release in Belgium. The site is at http://www.avalon-movie.com. 6 Sep 2004: That coming-soon item mentioned before hasn't come through yet, but what I do have today is information from Marcel Smetsers on two Dutch editions of Avalon. This reminds me - if anyone's got news/rumours about a UK release - please share them. 26 Jun 2004: Added a new item to the Thoughts page from Kathy - continuity error, or something deliberate - what do you think? 4 Jun 2004: Gérard Kraus reports that Avalon will have a showing on German TV next week - 13 June at 20:15 on the German Sci-Fi channel. Interestingly the film is titled "Avalon - play for your life"
05 May 2004: Apologies for the lack of updates for a while - I've been moving home. Two items that came in whilst I was between houses have now been added to the thoughts page. 27 Feb 2004: Added some more thoughts from a correspondent who prefers to be anonymous, but sees parallels beyond the Arthurian theme into the entire realm of chivalrous (or otherwise) behaviour. Also added a passing observation from one of my friends that bears some further thought. 07 Feb 2004: Not one but two treats today! Lucas Worwag has contributed a new original translation from the Polish spoken dialogue and James Byrne has performed an exhaustive translation effort working from the various Japanese sources (spoken, subtitles, and materials in the Memorial Box set). You can find the results on their efforts on the script page. 22 Dec 2003: My own copy of the R1 version turned up today. DVD details updated, and commentary on the disc and English dub is on the thoughts page. In summary, it's the first English dub, is a pretty job of it, but has some subtle differences from the original. There are no cuts that I noticed, though it has an R rating (as compared to the UK where it's a 12A). 17 Dec 2003: Stephen Norris has sent in details of the R1 version - they're on the DVD page. More details will follow when my own disc arrives. 14 Nov 2003: After a very quiet period for news, Alex Seltsikas reports that a R1 DVD of Avalon is now listed on Movietyme, Play.com, Amazon and other retailers. More interestingly some of these sources are reporting it has having an English dub - which would be new. Whether this is Neil Gaiman project, which was thought to have died, or something else remains to be seen! I will add DVD details to the DVD page once they are confirmed. 22 July 2003: Vogel's Polish transcription is now available here. 21 July 2003: Vogel has produced a Polish transciption of the dialogue which I hope to add here soon. He has also compared that with the English subtitiles - see the script page for the comparisons. Near a gray and unnamed city is The Zone, an alien place guarded by barbed wire and soldiers. Over his wife's strenuous objections, a man rises in the dead of night: he's a stalker, one of a handful who have the mental gifts (and who risk imprisonment) to lead people into The Zone to The Room, a place where one's secret hopes come true. That night, he takes two people into The Zone: a popular writer who is burned out, cynical, and questioning his genius; and, a quiet scientist more concerned about his knapsack than the journey. In the deserted Zone, the approach to The Room must be indirect. As they draw near, the rules seem to change and the stalker faces a crisis. http://us.imdb.com/Title?0079944 I could see how this film could've influenced Oshii. It has similar themes, its very slow in pace... There's also a dramatic shift in colour schemes, the first 30 minutes is shot in monochromatic sepia-toned grey, and then it suddenly changes into colour when they enter the Zone. 7 June 2003: Added comments from Ben-Rudiak Gould around the subtitle translation compared with the Japanese version of the continuity script included in the Memorial box DVD. I hope to add more comments from Ben in due course, and I'm still looking for more people to help with checking out all the subtitles against either the Polish soundtrack or the oiginal Japanese of the script. Please get in touch if you can help! Click here to read Ben's comments. 18 May 2003: Added some comments from Chris Pope. 18 March 2003: Added some thoughts from Tom Box and details from him of the the single disc Emotion edition of Avalon. 26 February 2003: Added some thoughts from Mart Kont. Added DVD-ROM content detail for the Belgian DVD courtesy of Etienne Bruggen. 25 February 2003: Can YOU help? I am always nervous about the accuracy of translation of subtitled films, and with something as subtle as Avalon the nuances of the language are potentially very significant. If you can translate Polish to English, and would be willing to do a translation of the spoken dialogue in Avalon please get in touch. Likewise, if you can translate written Japanese I'd like to hear from you! 19 February 2003: First update after the great server crash of February 16! Added some thoughts by Stuart Bray around the naming of the characters. 16 February 2003: Xavier Amet mailed me to explain a bit more about the French sites. In fact the new French site is the same one as previous, but relaunched under a new domain name. I've updated the web sites page to include this information and also the URL for Xavier's Avalon site within his own site. I've also put a graphic back on the DVD page to make navigating the site easier. 04 January 2003: Replaced the old DVD image pages with a new table summarising the differences between most of the known editions of the film (I've not included the French standard edition, since I consider the Collector's edition much better). The table now includes details of the Korean Special Edition, which provides a successor to the Memorial Box as the best version available currently with English subtitles (and the Polish DTS soundtrack), though it's a Region 3 NTSC edition. There's still currently no PAL edition with English subtitles or the DTS soundtrack. Sound: German and Polish Dolby Digital 5.1. Subtitles: German. Runtime: 102 minutes (normal). Format: 1:1.85 (16:9 anamorphic) RC 2 / PAL. Specials Features: Trailer (German and Polish) and a game. The game is played using the left, up/down and right-button on the remote to "kill" people. The German commission that rates Movies gave the movie a FSK 12 (suitable for People 12 and older) and the DVD as a whole a FSK 18 (because of the game :-) ). For more visit this site (German language) or amazon.de. 15 December 2002: Xavier Amet's French site has an analysis page about the film which puts forward some ideas which make sense to me. I've added a summary of his ideas to the Thoughts page, though a visit to the original is well recommended. 8 December 2002: Thanks to Alex Seltsikas for passing on the info that DVD Zone 2 now have the Belgian disc listed. It has DTS and the usual extras, but like the French DVD doesn't have any English subtitles on it. At the moment the best disc with English on it looks like the Special Edition (see below). The best edition overall is currently the French Collector's Edition which also includes the soundtrack CD of the film on a seperate disc (ie it's two DVDs plus a CD). 7 December 2002: More DVD news... The Belgian 'official' Avalon site now refers to a DVD. This is a new DVD release with cover artwork I've not seen before, and is definitely a new release because it has the URL for the Belgian site on the cover. I've not been able to actually find this disc for sale anywhere, so if anyone tracks it down please let me know. The Memorial Box edition looks to have been discontinued on schedule back in July, but a consolation prize is now available in the form of a Region 3 Special Edition which lists most of the extras plus the Polish DTS soundtrack which I thought was going to be on the French edition. The Special Edition is listed at Movietyme, though they don't have much detail about it. There's more detail about it at www.dvdasian.com. As usual sites mentioned here don't constitute recommendations, but I've had no trouble with Movietyme myself and have never used DVDAsian. I've just been exploring the French Collector's Edition... it's a treat with a lot of extra content and a local copy of another official site for the film, in French. I'm impressed by the French edition! 30 November 2002: The French DVD release does NOT have the DTS soundtrack on it. It does however have most of the extras from both Memorial and Anime Cartoon two-disc editions. The menus are very nicely done, and if the eventual UK release matches this standard we'll be in for a treat. By contrast the German edition looks like it's going to be very spartan. 13 November 2002: Avalon has seen a number of reviews this week, and is currently at a cinema in London's West End. Cambridge Arts Picture House will be showing it again for a week from Jan 10th 2003 - hopefully this is part of a more general UK release. A piece on Neil Gaiman's web site now suggests that his work on Avalon probably won't see light of day. A new 'official' Avalon site has come into being, serving the releases across Europe. The interview with Oshii is particularly recommended reading. the site assumes Flash though. The French and German Amazon sites both list Avalon now. There are two French versions, with the more complete adding the soundtrack CD. Some sites are reporting that the French DVD will have the Polish DTS soundtrack, so providing another way to obtain it for those who missed out on the Japanese Memorial Edition. No sign of a UK DVD release yet, but let's hope for something with plenty of extras! I saw Avalon first in July 2002 during the Cambridge Film Festival. When one of my friends mentioned the name Mamoru Oshii my ears pricked up - over the last couple of years I've been developing a taste for Anime and Ghost In The Shell was both a formative experience there and still one of my favourites. My favourites aren't always mainstream - Angel Cop is probably my #2. The near future. Some people deal with their disillusionment by seeking out illusions of their own - in an illegal virtual reality war game. Its simulated thrills and deaths are compulsive and addictive. Some players, working in teams called 'parties' even earn their living from the game. The game has its dangers. Sometimes it can leave a player brain-dead, needing constant medical care. Such victims are called 'unreturned'. The game is named after the legendary island where the souls of departed heroes come to rest: Avalon. Avalon is not Ghost In The Shell though, although it touches on some similar ideas - it is another exploration of reality and just whose perspective you're looking at it from. Where it differs significantly is that Avalon is not an animated film. It's live, filmed in Poland with a Polish/Japanese crew and Polish actors. That said, it has been extensively post-processed to apply colour draining, highlighting and special effects. This may sound a little reminiscent of the Matrix, and the two are in similar enough territory that it's hard to resist comparisons, However Avalon is two things Matrix is not. First, it's a very introspective, thought-provoking film, with no clear resolution and lots of questions to ponder along the way. Second, although it has action sequences (and impressive they are too, with genuine military hardware from the Polish army) it's not a VR action film even though the trailers might give that impression. It's a case where the whole is a worthy sum of its parts: a thought-provoking story which resists the Hollywood urge to explain everything; excellent casting and acting; settings which truly complement the story; and a soundtrack where Kenji Kawai shows his ability to turn his skills to composing an orchestral and choral soundtrack that fits perfectly with the film. The rights for the film have been bought by Miramax, so there will presumably be a theatrical release at some point. It's reported that Neil Gaiman will be working on the script. It may be dubbed since the original dialogue is in Polish, but I really hope not. I also hope Hollywood resists the urge to try to fill in the areas that have been deliberately left vague. In the meantime though, Avalon is becoming a favourite at film festivals, and is already available on DVD and CD soundtrack. After seeing the film I wanted to own it on DVD, and this site is intended as a one-stop information resource about what's available about Avalon at the moment and where it can be bought from. For the people who want the answers quickly, go to http://www.animebooks.com/ for the Making Of book, and http://www.cdjapan.co.jp/ for the soundtrack and DVD memorial edition. The single disc DVD can be ordered from http://www.movietyme.com/ This does not represent an endorsement of any of these - I've used them successfully, but your mileage may vary. Keep an eye on eBay too - the single and double DVDs show up quite often.